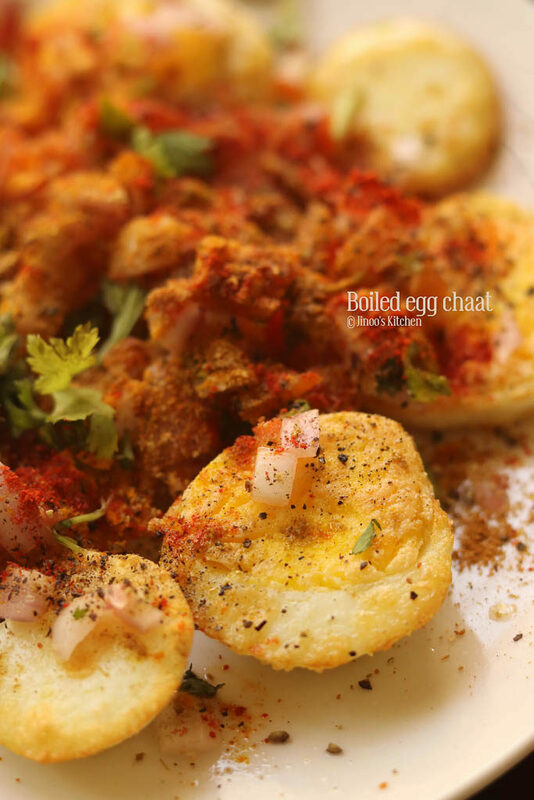 Egg Chaat recipe | Boiled egg snack recipe with step by step photos and video recipe. Simple, quick and easy snacks recipe with boiled eggs. One of the easy and healthy snacks idea for kids. 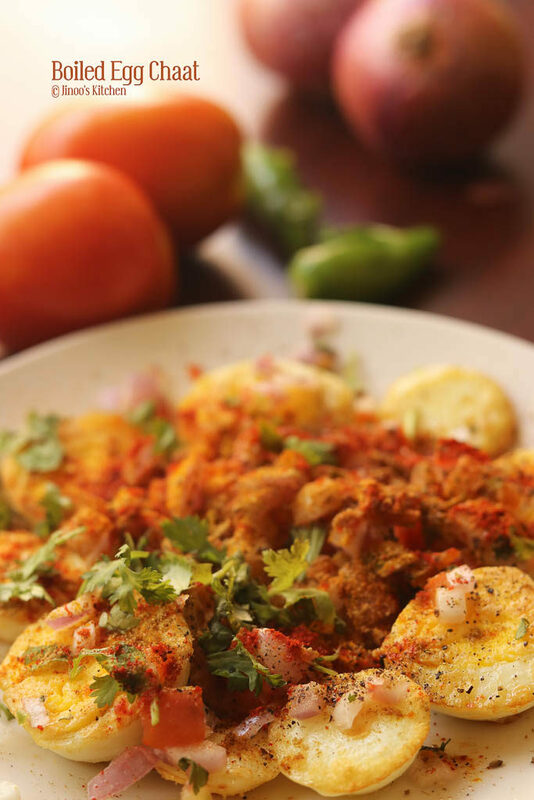 Eggs are the most loved ingredient at my home and we keep exploring lot of new dishes with it. My Mr is an expert in cooking Egg in various ways and this is one of his idea. 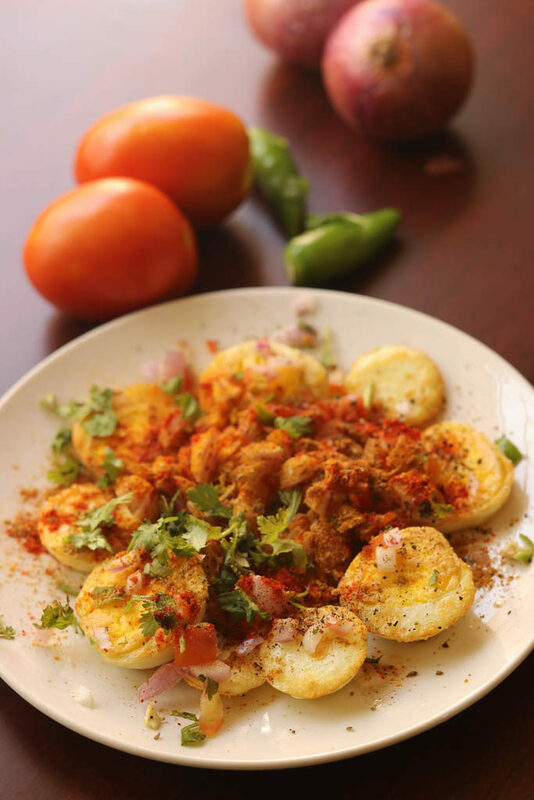 We simply loved the raw flavour of masalas and onions along with the fried Boiled egg. Try this at your home and you will surely love it. Adjust the spices as per your taste. A sprinkle of spice powders is more than enough. You can serve this as sides for your dinner meal or can be had simply as tea time snacks or as a breakfast. You should be looking out at this Egg recipes – 9 ways for simple and easy street food style Egg recipes. Slice the boiled eggs and shallow fry them in oil until toasted on both sides. 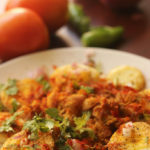 Mix together chopped onions, chopped tomatoes, salt, chopped green chillies and coriander leaves. Sprinkle the onion mix on the Fried eggs along with all the pinch of spice powders mentioned. Lastly, sprinkle little salt and coriander leaves and serve fresh. 1.Heat oil in a pan for shallow frying – Boil the eggs and slice them thinly. Toast them in the hot oil. 2. After few seconds, turn side and cook again for few seconds. Take out the fried eggs to a plate. Drain the excess oil if any. Deal with it gently so that yellow yolk doesnt come out of the white ring. 3. In another bowl, mix together chopped onions, chopped tomatoes, chopped green chilli, salt and mix well. 4. Arrange the fried eggs on the serving plate and sprinkle the onion tomato mix over it. 5. Sprinkle little pepper powder, red chilli powder, cumin powder, chaat masala and little salt. Everything a pinch will do. Lastly garnish with chopped coriander leaves and serve fresh!